For Cheam Phally, architecture is more than a family business; it is way of life. 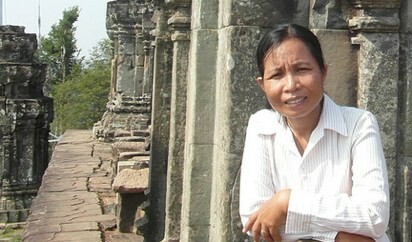 Phally is the senior architect and coordinator of the World Monuments Fund Program in Angkor, Cambodia. She is responsible for managing a number of architectural conservation projects at Angkor Archaeological Park, including a multi-year project supported by the U.S. Ambassadors Fund for Cultural Preservation to preserve the ancient stone temple of Phnom Bakheng — one of the great achievements of the ancient Khmer Kingdom. The five-year project at Phnom Bakheng is scheduled to be completed in 2013. "I was born in a construction family" says Phally. "I wanted to be an architect because architecture is rich with constructive ideas for serving people. An architect is a person who understands political, economic, historic, artistic, geographic, and philosophical concerns." On a typical day at Phnom Bakheng, Phally works with stonemasons, archaeologists, engineers, suppliers, accountants, public officials, and people from different backgrounds who contribute to the preservation of Cambodia’s ancient and unique cultural heritage. "Cambodia is small country, but it has a long history," says Phally. With more than 100 brick and stone shrines and seven large stone terraces, Phnom Bakheng is a major architectural monument in its own right. Decades of neglect and erosion due to poor drainage and heavy foot traffic have caused a number of structural problems which Phally and her team are in the process of correcting. "These monuments are the Cambodian cultural heritage and need to be preserved" says Phally. "I want to show them to the world... because Cambodian monuments are not only for the Khmer people but for all of humankind."